Editor's note: Dr. Sanjay Gupta also interviewed Nick Charles about the final fight of his life. That conversation will appear soon on "Sanjay Gupta, MD". This story was reported and written by CNN's Wayne Drash. Santa Fe, New Mexico (CNN) -- Nick Charles looks into the camera, as he's done thousands of times before. Except he's not calling a boxing match for sports fans around the world. He's talking to an audience of one: his 5-year-old daughter, Giovanna. Over the last 40 years, Charles has covered every major sporting event, from the Olympics to the Super Bowl to the Kentucky Derby. He's covered some of the most classic boxing matches -- when Buster Douglas knocked out Mike Tyson, when Tyson bit Evander Holyfield's ear, when Roberto Duran quit and told Sugar Ray Leonard, "No mas." Yet this is the toughest taping he'll ever deliver, a message from beyond the grave. For his little girl. As Charles stares into the lens, he projects the essence of a fighter -- tough, rugged, still smiling despite the bruises of battle. His wife of 13 years, Cory, holds the camera. Gone is his patented mop of black hair. Twice voted the sexiest sportscaster in America, Charles has undergone rounds of chemotherapy that darkened the circles under his eyes and "make me look like I'm halfway in the grave." On August 4, 2009, Charles was told he had incurable bladder cancer. He was given four to six months to live if he opted for no treatment. With treatment, he could expect about 20 months. "I want the biggest guns you can fire at me," he told the doctors. He's into his 21st month now. Each day, each hour, each breath is a gift. He's fought this hard for Giovanna and Cory, to build a foundation for them after he's gone. He knows what it's like to long for a father's love. He only has a dozen or so memories of his own father. "My little girl needs a good daddy more than anything right now," he says. "This is a gift from God where I need to build these memories for her, so that I'm not a blur." 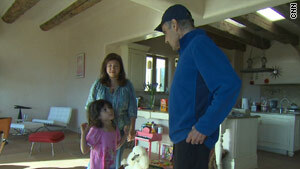 Former CNN sports anchor Nick Charles shares breakfast with his daughter, Giovanna, who is 5. The family has begun making preparations. They meet with a counselor regularly. When he was diagnosed, Charles told Giovanna he was sick -- that his hair would fall out. Weeks earlier, Charles and his wife sat down to tape the first in a series of birthday videos he's leaving for Giovanna. The camera rolls. Charles sings. In TV terms, he nails it. Because she's so much fun! Giovanna races around the family's spacious contemporary adobe home in Santa Fe, New Mexico. Still wearing the princess shoes from her 5th birthday party the day before, she clicks across the tile floor, squeals of delight bouncing off the high ceilings. "A gift from God," Charles calls her. "A blessing who came to me late in life." He has three grown children from two previous marriages. His impending death has brought him closer to them -- including a 39-year-old son who sat with him during chemo sessions. Don't worry. Daddy will always be in your heart. His focus has been on his youngest girl, keeping a written journal since she was born, and recording the birthday videos after his diagnosis. He only recorded a handful; he was sobbing so much off-camera he could barely hold it together to go past her 11th birthday. When Charles mentions Giovanna by name, he chokes up. Every few days, he walks into her room and looks in her closet, at the princess outfits and leotards. He pictures her prom dress hanging there years from now, knowing he'll never see her in it. He breaks down and cries. For Cory, the pain is unbearable, to witness the slow decline of the person you love. The woman Charles calls his rock, the love of his life, collapsed when she and her husband first learned of his illness. A producer for CNN International, she has continued to work because it keeps her focused. Yet she's already begun a grieving process to prepare "for when he won't be here." She's in touch with bereavement groups and camps to help children who have lost a parent. When Giovanna recently saw her mother crying, the girl consoled her. "Don't worry," she said, "Daddy will always be in your heart." "You can never know what it will feel like when someone dies and is gone and how you will handle it," says Cory, 45. "From young widows, I know the feeling is profoundly sad, especially when somebody has such a presence as Nick." Both are willing to speak so openly about their ordeal because, as Cory puts it, "too many Americans fear death." Adds Charles, "I embrace it." He fights through fear. Charles has always set goals in life: short-term, mid-term and long-term. He'd like to live until one more Easter, until his dream home is complete in early May, until his 65th birthday on June 30. "I don't know how long I have." Just waking up to live one more day is blissful. In January, he called off all treatment. "I said, 'I can't take this chemo any more. It's going to kill me before the cancer. I want to feel everything in life while I can.' "
Charles talks with hs wife, Cory, and their daughter at their home in Santa Fe, New Mexico. In the evenings, as the sun sets, Charles stares out the window and contemplates life. Looking back at him are the mountains that surround his home. The pain arcs through his body. His toes feel frozen. "God, if you're ready to take me," he says, "I'm in so much pain. Please, I'm ready to come home." "One time, he sat right with me on the bed." The mountains are known as Sangre de Cristo, the blood of Christ. Charles focuses on three peaks. "Mommy, Daddy, Giovanna," he says. A sign they'll always be together, a sign of eternity. He says a special prayer for Giovanna: "Don't let my daughter find me." Happy 7th birthday, my darling. You're in 2nd grade now. I just wish you the best life offers -- always. Charles shuffles through his kitchen when his cell phone rings. He pulls the phone from his pocket. It's Mike Tyson. The two men speak by phone three or four times a week. They talk about life lessons and philosophize about Aristotle. Tyson has young children, too. He asks about being a good parent. I try not to dwell on the mistakes. You can't undo them. On this day, they hastily arrange a visit. "I want to see you again," Charles says. "You're a true friend, Mike, and I love you!" The two reunited for the first time in years in early March. They sat in the MGM Grand Garden Arena in Las Vegas, the same place where Tyson took a chunk out of Holyfield's ear in 1997. This time, Tyson wasn't dishing out punishment or acting in a rage. He was talking and listening, absorbing everything Charles had to tell him about life. "I love you, brother," said Tyson. "I pray for you every day." He told Charles to not give up, to keep hanging in strong -- that he needed him here longer. Tyson clutched Charles' hands for 15 minutes. He refused to let go. When autograph seekers approached, Tyson flashed a bone-crushing look. They quickly scattered. In Tyson's heyday, when he was the world's dominant boxer and one of sports' notorious bad boys, Charles would offer him advice. The reporter saw an inner-city kid who grew up without consequences, a young man with a lot of self-loathing, a guy with a lot of pain. Charles knew the feeling. He grew up poor in inner-city Chicago, the son of a taxi driver who was mostly absent from his life. In grade school, during the frigid winters when his dad didn't pay the heat bills, Charles would curl up in bed with his mother and brother to stay warm. "I'm inhaling this lye and I had to scrape all this stuff off. I said to myself, 'I need this job. I can't tell this guy to go take a flying leap,' " he says. He had to fight for everything he got as a kid growing up. "But I also said to myself, 'I'll never be trapped again in life. Never. Never.' That was a watershed, life-changing moment for me. It really drove me to the point where I had focus in my life." Years later, when boxing promoter Don King first introduced Tyson to Charles in the 1980s, King shouted in his loquacious style, "He's one of us! He's a real guy! He came from nothing!" At a time when Tyson trusted no one, he listened to Charles. "You can break me in two if you want," Charles would say before giving any advice, "but let me throw this out to you." He told him about his own hard-scrabble life, of longing for a father's love, of the power of forgiveness, of digging deeper to better understand oneself. Now, as Charles nears death, Tyson is like a sponge. "He recalls conversations we had," says Charles. "He wants me to amplify it more. He wants to know what I've learned, because I've made mistakes in my life." "I try not to dwell on the mistakes. You can't undo them. But I do try to fasten onto the positives, the things that drove me." Charles says he got married too young, was too immature to know what a relationship entailed. He worked into the wee hours of the night. His job kept him on the road. He first married at 22. He had a son, Jason, and a daughter, Melissa. He stayed married for eight years; Melissa was a toddler when he divorced. His second marriage lasted about a dozen years. They adopted a baby girl from Korea. Katie, now 24, recently qualified for the Boston Marathon, he boasts. Divorce is an ugly thing, and "innocent kids get hurt and lost in the middle. "I caused a lot of pain. I ripped apart lives," he says. "If I have a regret, that's it. I love all of them." He's recorded 10 hours of oral history -- essentially his life story -- for all his children to hear after he's gone. "With my illness, they've offered me a massive amount of forgiveness." I can't even imagine 8 years old! You're probably standing up on the horse without a saddle. Because you're so athletic and strong and beautiful. Charles longed for a relationship with his father, a machine-gunner in World War II who fought in ferocious battles in North Africa and Italy, earning a Bronze Star for his valor. His father was rarely around to spend time with his two sons. He drove taxis at night. Other times, he just disappeared. "He was a voracious reader," Charles says. "The few nights he was home, I used to sit with him and read. He'd have a pot of coffee on. It was the summer. We didn't have AC. It'd be 80 degrees outside. "I was maybe 15. I would just sit with him and read until 2 or 3 or 4 in the morning, so I could just be next to him." He still remembers the books they read: Norman Mailer's "The Naked and the Dead" and William Faulkner's "The Sound and the Fury." "He did the best he could with me. I've come to peace with him." His father was there for him on the most important day of his career, when he auditioned for his first television job in Springfield, Illinois, in the fall of 1970. At the time, the young Charles drove a taxi. He'd graduated a few months earlier from Columbia College Chicago, where he studied communications and journalism. Father and son drove the 200 miles to Springfield together, the son in a freshly pressed suit, his soon-to-be signature hair perfect. After a two-hour audition for WICS, Charles hopped back into the car: "Dad, I think I did pretty good." The two dined on steak and scotch. "It was the greatest day. I felt like we were two men who had bonded." Two days later, he got the job. He took a pay cut to enter the television business: $130 a week as a sports anchor, compared to $200 driving a taxi. Born Nicholas Charles Nickeas, he was told by his news director that his Greek name was too ethnic, to change it to something more "vanilla." At age 24, Nick Charles was born. In two weeks, he went from driving a taxi to having his face on the sides of buses. Less than two years later, Charles took a giant professional leap, replacing a beloved sports anchor in Baltimore. His boss in Springfield told him, "Nick, you're making a huge mistake." Have a love of language and literature. Learn to love your own company so you're not needy. Ask yourself where do you want to be tomorrow? What about in 5 years, 10 years? What do I require in a relationship? What am I capable of giving? Enjoy little moments and turn them into ecstasy. Fasten onto the positives of life. Go to the doctor -- even for the most routine checkup. Charles endured months of angry phone calls from viewers and hostility among staff for replacing a legend. "It cut deeply." Yet he persevered. Soon, he was No. 1 in Baltimore -- and viewers loved him. Before the world would come to know him, there would be stumbles. He was canned from a station in Washington in 1979. He thought about quitting TV altogether. The man who People magazine would eventually rank among the most handsome in America went into radio. "I enjoyed the humility." In January 1980, his life changed forever. He got a call about a 24-hour news network being formed in Atlanta by Ted Turner. 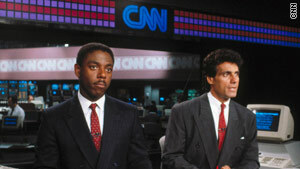 Charles became the first sports anchor in CNN history. And it's at CNN where he shined. In his prime, he teamed up with Fred Hickman on "Sports Tonight." The two had chemistry, charisma and dynamism -- a duo of boundless energy. They beat ESPN in ratings when both upstart networks were battling for every viewer. "We just clicked from the very beginning," Hickman says. "In television, you always have personality conflicts. Nick and I never had one. Nick and I have always had a tremendous relationship." Fred Hickman teamed with Charles on "Sports Tonight." The two had chemistry and beat ESPN in the ratings. Viewers tuned in every night to catch the latest sports news. Topps put Charles' million-dollar smile on a bubble gum card -- rare for a TV personality. Women swooned. In airports, it was hard to go unnoticed. Fans would say: "I love you, Nick Charles! And I hate that guy Chris Berman on ESPN!" The black-maned, olive-skinned beauty always had a line for them. "Please don't use that word -- hate. Berman is a friend." The feelings were mutual. "We were competitors but we never felt that way," says Berman. "I have nothing but good things to say about Nick Charles -- nothing but admiration -- and I'd like him to know that." Charles' field producer in those early days was Jim Walton, now president of CNN Worldwide. He and Charles traveled the globe together, eating at cheap food joints and working long hours. The two were in Tokyo in 1990 when Tyson faced a weak opponent named Buster Douglas. They didn't plan to do many stories. Everyone in press row picked the undefeated world champ to win in the first round. Charles had gone to Tyson's room the night before the fight. He saw a man who wasn't taking Douglas seriously. Tyson wanted to get the match over and fly back to the States. But the unthinkable happened. Douglas knocked out Tyson in the 10th round. Always a lover of literature, Charles told viewers that Douglas "threw the book at him and it made for bad reading," one of his most famous lines. "It speaks to the uncertainty," Charles now says of the match, "that anybody's cloak of invincibility can be ripped away." Charles left CNN in 2001 when the network dropped sports. To this day, he and Hickman remain one of the longest anchor duos paired together in television. From CNN, Charles moved to Showtime to cover boxing. Walton says Charles had always been drawn to the sport because "he had to fight for everything he got as a kid growing up." It's that trait that's helping Charles in his current battle. "He's handled this like a heavyweight champ," says Hickman. "If I can do as well living the rest of my life as he is living out the rest of his, then I will consider it a success." Charles cries when he talks about the strength of boxers. He knows the sport is barbaric; he readily admits that. Yet when he looks at the ring, he sees young men like him from the inner city. Charles, who boxed as a teen, says his upbringing "gave me a love of people who want to make it so bad." "You're going to get hit. You have to take pain to get it," he says. "You have to fight through fear." On that day in August 2009, when he was first given a death sentence, he promised himself: "There's no way I'm going to wimp out on this." Maybe traveling to wonderful places. And so many glorious places to explore and just be captivated by. Charles walks with a limp, part of the side effects of chemo. His famous hair is now gray, sparse and closely cropped. He's taken phone calls from Bob Costas, Willard Scott and countless other television stars and athletes. He likes it even more when he hears from interns, cameramen, producers and fans -- the blue-collar people who always rooted for him. 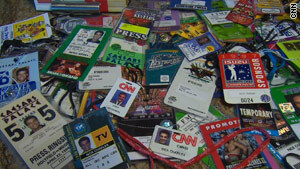 Over the last 40 years, Charles has covered every major sporting event, from the Olympics to the Super Bowl. Not many people, he says, are fortunate enough to attend their own memorial service. A slow death allows that. His brother died of a sudden heart attack in 1988 at age 43. His father died in 1975, his mother in 2003. He's the last of his immediate family. He reads the Bible often. He sprinkles "God bless you" in his conversations. He says his wife "brought me back to the Lord" in the 1990s. He's spent these final weeks with those he loves most. He's picked the music for his memorial service -- Edward Elgar's Sospiri op. 70, with the cello played by Sol Gabetta. Last month, he signed off on television for what is likely the last time after calling a featherweight fight on HBO. "Why am I doing this?" he told viewers. "To inspire others to do what they love." "I had a smile on my face all night," he says now. "I was on fire!" He's talked with counselors and hospice workers about his final week. It will go something like this: He'll lose his appetite first. After three days, he'll be unable to swallow and feel like he's drowning. His liver will stop functioning and other organs will follow. The cancer will take over completely. He'll be given morphine to ease the pain. As a Christian, he struggled with that concept. He wanted to make sure he wasn't committing suicide. "We're not pulling the plug on you early," he was told. "We're just keeping you comfortable until the end." With those words, he says, "Peace came over me." "I can't believe I feel so good about the last week of my life, but I do." He hopes his final words will be to that beautiful girl, Giovanna: "I'm going to heaven to prepare a place for you and ... we're going to be together forever." Charles has traveled to 70 countries; he has one journey left. He hopes his first interview when he gets there will be with Jesus, followed by a round-table discussion with Abraham Lincoln, Mother Teresa, Mohandas Gandhi and the Rev. Martin Luther King Jr.
"I'd ask them: What motivated them? What sparked them?" When that day comes, he says, he'll dance around the ring, his head held high, a smile on his face. "In the 12th round, somebody is going to raise my hand. I'm going to be victorious. "I finally got my life right." If you're inspired by this story, Nick Charles and his family would be honored if you made a donation to help stop child trafficking and abuse, increase access to education and allow children to embrace life. Working with the humanitarian organization World Vision and the TEACH NOW: Preventing Child Labor in the Philippines project, the family welcomes support here: www.worldvision.org/EmbraceLife.